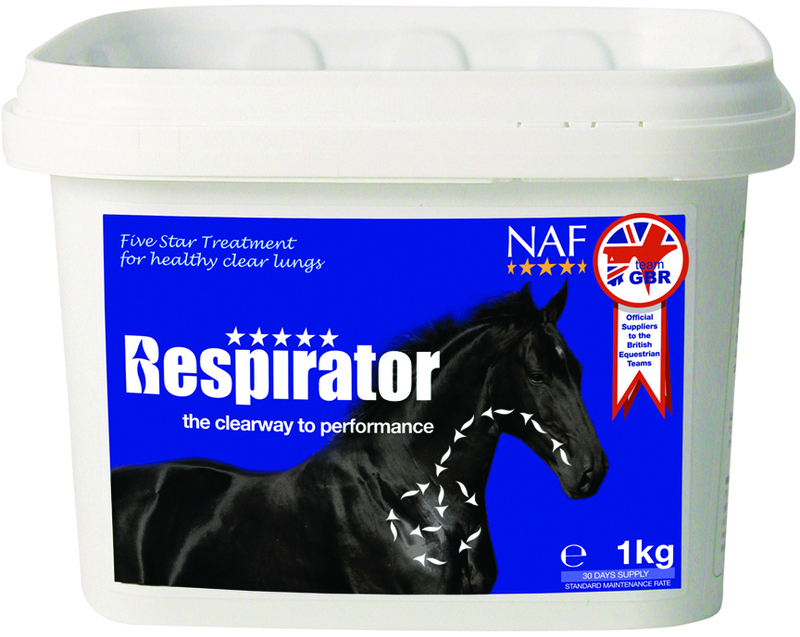 NAF Five Star Respirator Powder provides high quality nutritional support for your horse's respiratory system. It's full of natural anti-oxidants, as well as herbs known to promote a healthy respiratory tract. NAF Five Star Respirator Powder contains Milk Thistle; Gingko leaves; Omicha berries; Hawthorn berries; Rosehip; Turmeric; Rosemary; Ginger; Licorice; Chlorella; Dandelion; Blueberries & MSM, to aid the functioning & immunity of your horse's lungs. Respirator is ideal for horses who: - Are sensitive to dusty stables or hay - Often develop allergies in summer - Are sensitive to pollen - Need a product to help with their breathing, that can still be used under competition rules. Feeding Instructions: Feed a loading rate initially, for the first 7-10 days, then lower to a maintenance rate. Horses & Ponies- Loading rate feed 66g daily Maintenance rate feed 16.5-33g daily 1kg will last upto 60 days (based on 16.5g daily) 2.5kg will last upto 151 days (based on 16.5g daily) NAF is part of the BETA NOPS scheme.